Another company I decided to add to my options portfolio is Kodiak Oil & Gas Corporation. Kodiak is focused on the exploration and production of crude oil and natural gas in the United States. Kodiak now looks to develop its robust portfolio of assets. The energy company plans to grow production 80% year over year during the interim (Source: Motley Fools). 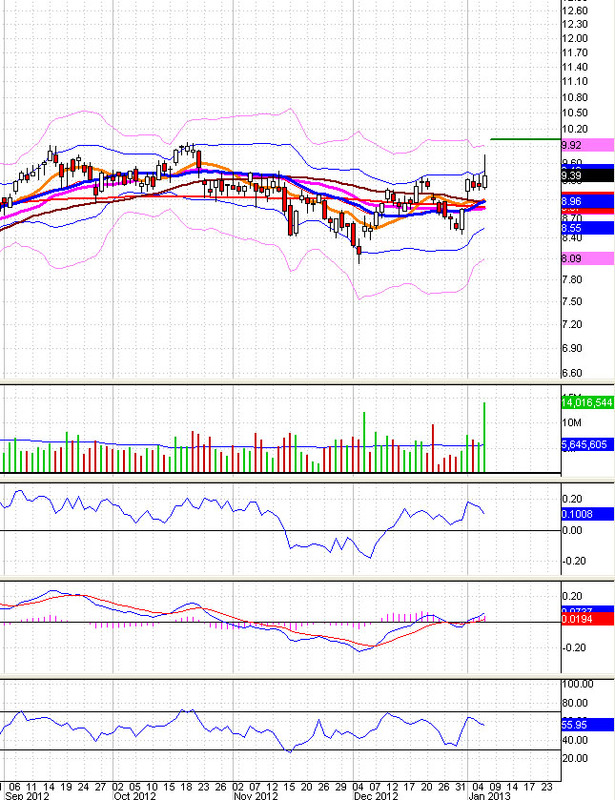 There are 18 brokers following this stock and the mean price target is is at 11.39, with high target at $13 a share. Credit Suisse, The Street, Global Hunter Securities, Wunderlich, and Canaccord Genuity are bullish on the stock. The company achieved over 250% revenue growth in FY2012 and analysts expect almost 100% sales increases in FY2013. KOG has a minuscule five year projected PEG (.40). Earnings per share more than quadrupled from FY2011. Earnings are project to rise another 75% in FY2013 by analysts. The stock is priced at less than 13x forward earnings, a discount to its five year average (16.7) (Source: Seeking Alpha). Since the stock has a bullish expectation with a great growth potential and it is a buy at $9 a share I decided to play this stock as a covered call – total return strategy (meaning that I want the stock to be called away). The stock will slowly grow and chop around $10 a share and it will be called away. In that case I will realize above spelled ROI. Since I like this stock, I will most likely repeat the process and buy-write another trade after this one will be over. The stock won’t rise above $10 a share. but stays above my break even point. In that case the option call expires worthless, I’ll keep the stock and a premium and sell a new $10 option for the next period. I will repeat this process as long as the stock is called away. The stock will skyrocket and surpass quickly the current strike price and lands at 12 or even 13 dollars a share during the end of January or February 2013. If that happens I want to participate on that growth. In that case I would buy-write another contract with higher strikes. I will continue doing this as long as the stock will be rising. The stock will suffer and falls too deep before expiration. In that case I will evaluate a trade repair strategy similar to one I described for my DMD trade (see My DMD covered call and fiscal cliff? post). I might be selling another lower strike OTM covered call before I sell deep ITM covered call to get rid of this trade break even or with a small gain. Marvin, Thanks. I am falling in love with them too, although I am still learning how they work and mainly want to learn what to do when things do not go the way you want it. I do not understand what you mean about beating 10% in matter of months? Thanks for stopping by as usually I truly appreciate it. Loved covered calls! You can’t beat almost 10% in a matter of months!